Scratching your head over why The Salt Lake Tribune keeps running stories about how newspapers are failing? This might be a clue. Editor & Publisher, the magazine of the newspaper industry, just ran a story predicting that Salt Lake City is headed toward becoming a one-newspaper town. And the name of the one newspaper … the Deseret News. News Editor Joe Cannon is quoted in the story saying the reason for the Deseret News improvement was its decision to go “more Mormon” with coverage tailored to LDS faithful throughout the country. The story additionally noted that the LDS church has recently tightened its control over the Deseret News, replacing the paper’s board of directors with people tied to South Temple. 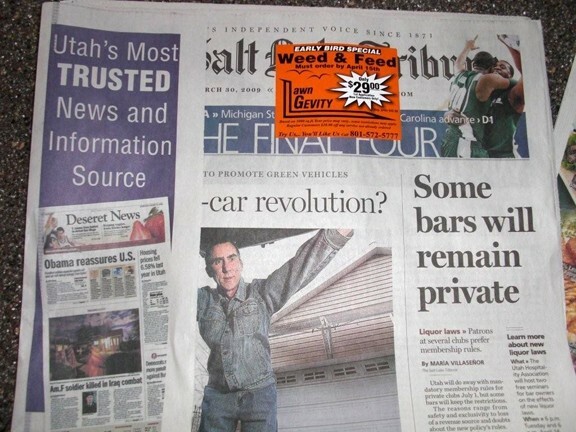 For a glimpse of the future of daily newspapers in Salt Lake City, take a look at this “wrapper” The Trib put on recent edition of its paper.